Naturally present for brief periods in muscles and various tissues. Used for improving speech and behaviour in those with autism, and for increasing attention and neurological function. Sarcosine (N-methylglycine) is a methyl derivate of the amino acid glycine. It is found in egg yolk, turkey, ham, vegetables and legumes. It was first isolated and named by the German chemist Justus von Liebig in the mid-19th century. 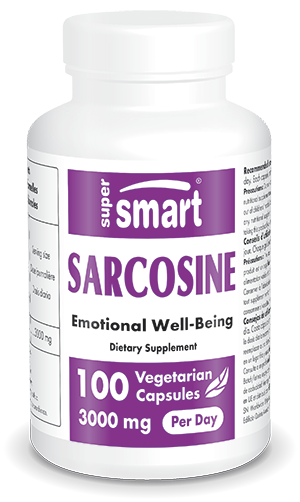 Sarcosine is naturally present in the body in muscles and various tissues via the enzyme glycine dehydrogenase. It is formed from choline intake and from the metabolism of methionine, and is then broken down into glycine, an important constituent of protein. Sarcosine is essential for muscle synthesis and composition but it is also the principal metabolic source of glutathione, creatine and serine. • It naturally increases levels of testosterone when combined with D-aspartic acid. By encouraging production of GnRH (gonadotropin-releasing hormone) by the hypothalamus, it boosts the release of FSH and LH which in turn stimulate the testes to produce more testosterone. • It also inhibits the transport of type 1 glycine (GlyT-1). Sarcosine supplementation therefore increases glycine concentrations in the brain, so activating N-methyl-D-aspartate (NMDA) receptors. According to clinical trials, it therefore has nootropic effects and improves symptoms of depression. In addition, an ongoing avenue of investigation shows that sarcosine supplementation, at a dose of 2g a day, may even reduce symptoms of schizophrenia when used alongside existing treatments. Promising results show reductions in cognitive symptoms and depression. It may improve cognition and mental processes, increase memory and rate of recall and develop capacity for learning. These effects may be linked to its effects on glycine receptors in the brain. Sarcosine thus constitutes a new nootropic, along with noopept, or AFA extract. Supplementation benefits healthy adults just as it does those with Alzheimer’s disease undergoing what can be aggressive treatment to alleviate degenerative cognition problems. As with any nootropic, it supports the body in adapting better to life’s challenges, facilitates motivation and decision-making and improves cognitive and neurosensorial processes as a whole. The recommended dose is between 1.5g and 3g a day, preferably split into two doses. Sarcosine is free from toxicity and few side-effects have been reported, apart from a few headaches or gastric problems when starting supplementation, as is the case with any brain tropism nutritional supplement, but this does not, however, constitute a contraindication. adults. Take 3 to 6 capules a day. Each capsule contains 500 mg of sarcosine.